James Addy took straight to the front of the pack in the first race, followed by Andy Mitchell, Chris Walker and Richard Sharp. It took the first two laps and a few position changes for the order of racing to settle down. The top three were drifting into the first left hander and entertaining the crowd, as James led Richard and Chris with Andy back to fourth. Positions two and three changed mid race to leave James showboating with a wheelie in first place over the line, followed by Chris Walker, Richard Sharp and Andy Mitchell. Craig Richardson would have been in contention but had to fight to regain his fifth position. Paul Wilby had a good start but could not maintain his position and Graeme Norris made the best of the mid pack racing to take sixth. Chris Walker was first off the line in the second race but Andy Mitchell had taken the front position going into the dirt section for the first time, with Chris now back in second and James Addy in third followed by Richard Sharp. On the third lap James passed Andy for first place which saw him rutted; as both Chris Walker and Richard Sharp made their way past. These would be the top four finishing position despite Craig Richardson starting to move ever closer to Andy Mitchell for fourth. Ben Kirkman also fancied that position as he watched from the sidelines following his recent shoulder surgery. Graeme Norris held onto sixth again with Paul Wilby close behind. Chris Walker led the final 450 race of the day but not for long as Richard Sharp was the first to pass him then James Addy followed. James then dropped back to fourth place after stalling his bike, leaving Richard at the front followed by Chris Walker and Andy Mitchell. The longer race meant backmarkers would come into play and James had the opportunity to challenge again for third place. 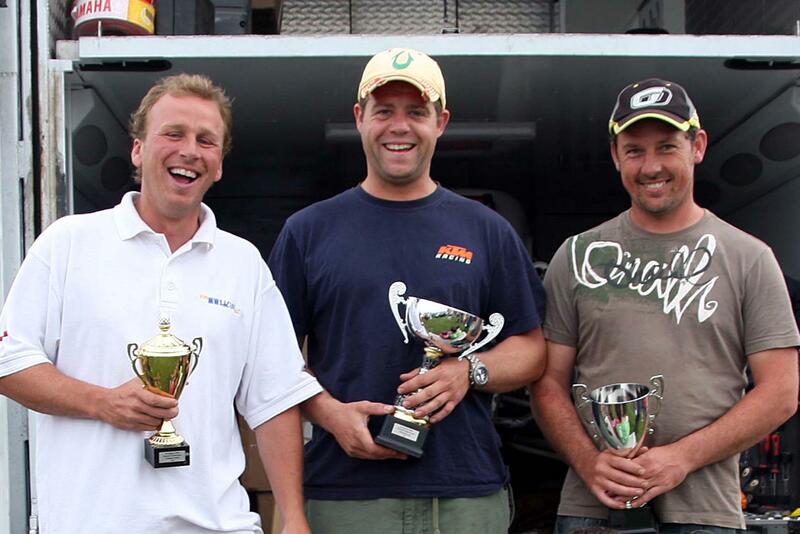 Richard Sharp took the win from Chris Walker, James Addy and Andy Mitchell in fourth. Craig Richardson had fifth place sewn up in every race and Graeme Norris had the same for all three sixth place finishes. Mark Smith moved up two places to lead Steve Ellis, who was coming under pressure from Luke Hough Whelpton, and these two had exchanged places all day.